BrokerCheck records are supposed to accurately reflect brokers’ registration, complaint and disciplinary history but, inexplicably, sometimes BrokerCheck records are materially false. Like other problems we’ve identified with BrokerCheck, there is an easy, low-cost fix. We have recently written about the problems with FINRA’s BrokerCheck and suggested a simple free market solution that would allow investors to protect themselves with no further regulation. How Widespread and Predictable is Stock Broker Misconduct? In Have 1.3% or 7.3% of Stock Brokers Engaged in Misconduct? we explain why estimates of broker misconduct vary so widely. In Smaller Firms are Even Worse! we show that smaller firms have proportionately far more brokers with customer complaints and far more brokers that have previously been fired by other firms for misconduct. An important take-away from our study and from Egan Matvos and Seru’s The Market for Financial Adviser Misconduct is that the industry has a problem with small and medium-sized brokerage firms. Bad brokers get sorted into these firms, many of whom specialize in preying on unsophisticated investors. These same firms are more likely to leave unpaid arbitration awards as they dissolve when the misconduct toll gets too large. In Figure 1, we list the 10 highest risk brokerage firms measured by FINRA’s Investor Harm measure. Oppenheimer is the only one of these 10 firms with more than 1,000 brokers. The rankings in Figure 1, in our working paper, in FINRA’s 2015 BrokerCheck study (available here) and in Egan Matvos and Seru all depend on BrokerCheck records being accurate. In our ongoing research, we have found instances where brokers fail to disclose customer complaints arbitrated to customer awards. Not surprisingly, the non-disclosures we have uncovered so far occurred at the worst firms. Our first example is a Centaurus broker, Fera Shivaee (CRD #2271590). Ms. Shivaee’s BrokerCheck record, current as of June 29, 2016 lists only two customer complaints, both listed as “pending”. Ms. Shivaee’s Case 13-02924 was arbitrated 13 months ago and resulted in a $915,249 customer award available here. You might think FINRA’s award database, which includes the $915,249 award, would be linked to FINRA’s BrokerCheck database since they share a unique case number so that as FINRA records the award Ms. Shivaee’s BrokerCheck record was updated but it was not. 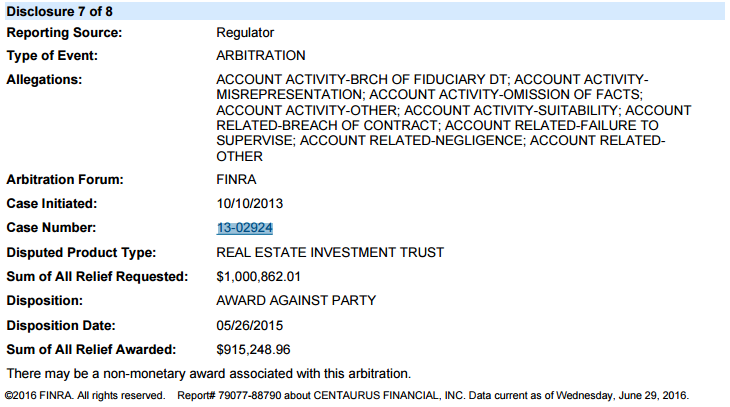 FINRA knew there was a $915,000 award in this case more than a year ago, that Centaurus paid it and that the case filing has not been expunged yet Ms. Shivaee’s BrokerCheck today still lists the case as “pending”. 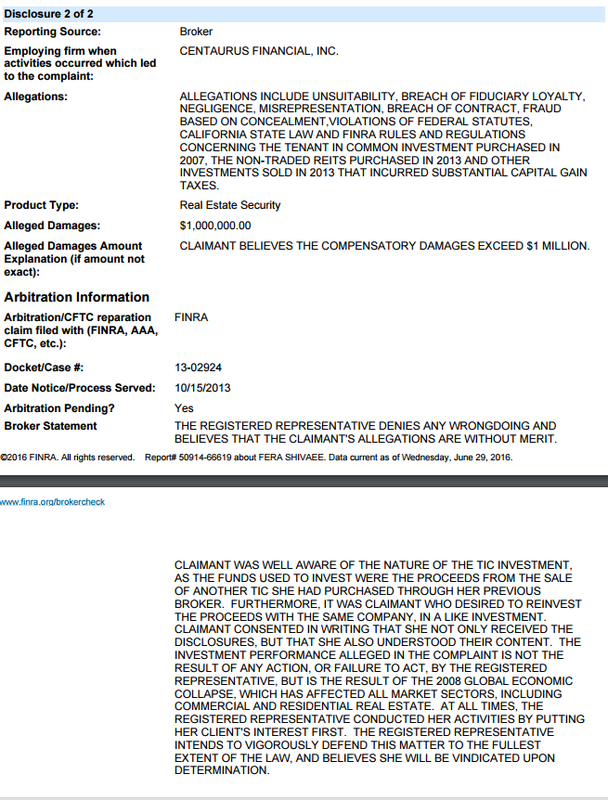 What’s even more surprising Centaurus’s BrokerCheck report correctly includes this case as resolved on May 26, 2015 with a $915,249 customer award. So, Centaurus knows it was ordered to pay $915,249 in a case involving its broker but has not updated her BrokerCheck records 15 months later. There is even a little more intrigue over Ms. Shivaee’s BrokerCheck. She had two cases expunged after Centaurus paid $160,000 to settle one dispute and “a substantial sum” to settle the second case. In the first case, Lee v Centaurus Financial, the Claimant was obligated to assist Ms. Shivaee’s attempt to expunge the case filing and did not participate in the expungement hearing. The panel granted the expungement in an order available here that included a sharp dissent. In the second case, Robins v Centaurus Financial and Fera Shivaee, the Claimant’s attorney participated in the expungement hearing and objected but the panel nonetheless granted expungement. The order is available here. As the award states, Robert Gonser, the attorney for Kenneth Robins, argued against the expungement of the claim as to Shivaee. Mr. Gonser said that he made it clear to the arbitration panel during the telephonic expungement hearing that he and his client held Shivaee directly responsible for placing Mr. Robins in the unsuitable TIC’s and that in his opinion, the culpability and wrongdoing of Shivaee was confirmed by the “substantial settlement” paid by Centaurus as referenced in the arbitrators award. Mr. Gonser added that he was shocked to receive the award and see that the panel had expunged the matter from Shivaee’s record. “I am not at liberty to disclose the amount of the settlement”, stated Mr. Gonser, “but suffice to say that because the panel labeled it “substantial” this was not a nuisance settlement for the Respondents.” It should be noted that Mr. Gonser’s client Margaret Smith refused to settle her claims against Centaurus and Shivaee and ultimately received the $915,249 award discussed above. In summary, Ms. Shivaee’s BrokerCheck record shows two “pending” customer disputes and include strong disavowals of both. Using FINRA’s definition of Investor Harm, Ms. Shivaee has not been involved in an Investor Harm event given her current BrokerCheck. One case has been resolved to a large customer award and two cases resulting in substantial settlements have been expunged from her record. As we will explain in later posts, far too many filings are expunged and these two cases are clearly such filings. Applying FINRA’s probit model using settlements and awards to Ms. Shivaee’s public BrokerCheck we locate her at about the 96th percentile in the distribution of probability of engaging in future customer harm. To put this is greater context, if we select 1,000 brokers at random, there would be about 40 brokers who appear more likely to commit investor harm than Ms. Shivaee given her disclosures. Correcting Ms. Shivaee’s non-disclosure and adding back in the expunged settlements we find she would be at the 99.7 percentile and conclude only 2 or 3 out of 1,000 randomly selected brokers would be more likely to commit investor harm than Ms. Shivaee. Our second example is a current Independent Financial Group broker, Jon Gregory Sanchez (CRD #2418439). Mr. Sanchez’s BrokerCheck record, current as of June 29, 2016 lists two customer complaints, both listed as “pending”. The conduct subject to those complaints occurred when Mr. Sanchez was at a now defunct firm, QA3, which went out of business in part because of adverse arbitration rulings. 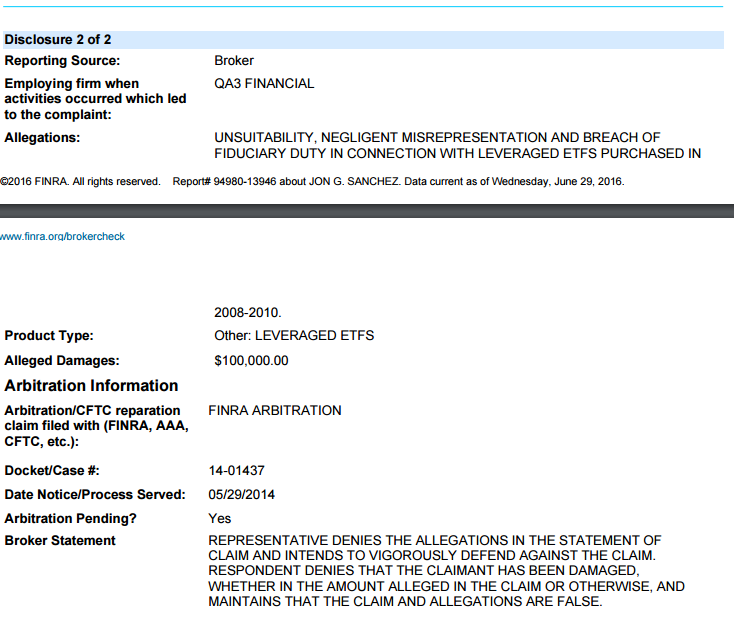 Neither of these cases on Mr. Sanchez’s BrokerCheck are “pending”. Both have gone to a final hearing and been won by the customer. The award in case #14-01436 is available here and the award in case #14-01437 is available here. Applying FINRA’s probit model using settlements and awards to Mr. Sanchez’s public BrokerCheck we locate him at about the 94th percentile in the distribution of probability of engaging in future customer harm. If we select 1,000 brokers at random, there would be about 60 brokers who appear more likely to commit investor harm than Mr. Sanchez given his disclosures. Correcting Mr. Sanchez’s non-disclosures we find he would be at the 99.3 percentile and conclude only 7 out of 1,000 randomly selected brokers would be more likely to commit investor harm than Mr. Sanchez. In the two examples we’ve just provided, the employers, Centaurus and Independent Financial Group, appear to have not complied with their obligations under FINRA Rule 4530 to report to FINRA arbitrated cases. See NTM 11-06 available here. Of course, there is a simple solution. 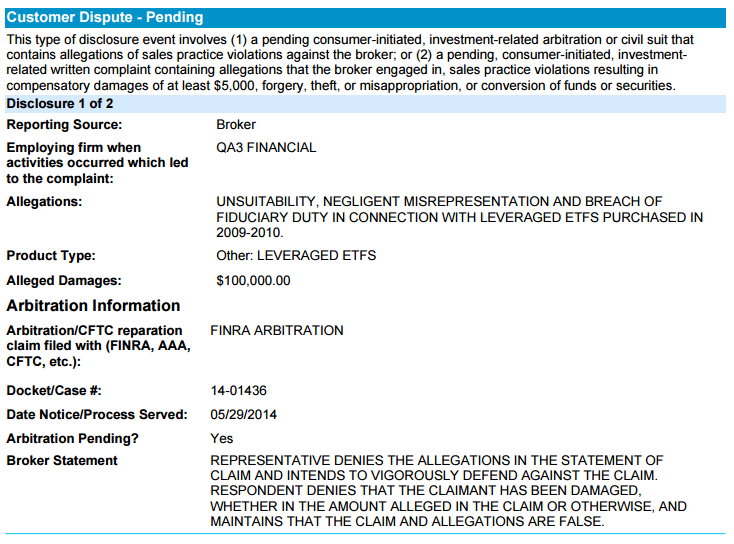 FINRA’s award database records the results of all filed claims identified by a unique case ID number. It appears based on our research that this awards database is not linked with the BrokerCheck database so the same unique case ID can appear differently in a broker’s BrokerCheck and in the awards database. Even more surprisingly, within the BrokerCheck database, a case like Smith v Centaurus can appear in Ms. Shivaee’s BrokerCheck as “pending” and in Centaurus’s BrokerCheck as a $915,000 adverse judgment. A good database programmer would fix this problem in an afternoon making it more difficult for bad brokers to hide adverse judgments.